If you love sushi, but don’t feel like all the fussing, this is the recipe for you. I found this recipe in a Gourmet magazine more than a decade ago and have been making it ever since! It is quite simply, divine! I have shared this recipe so many times that I am very excited to finally put it on this blog so that I never have to type it out again! Yeah! Don’t let the long list of ingredients scare you because it is worth every minute you will spend putting it together. Also, if you are not really a sushi lover because you don’t like raw fish, this recipe has NO fish in it. 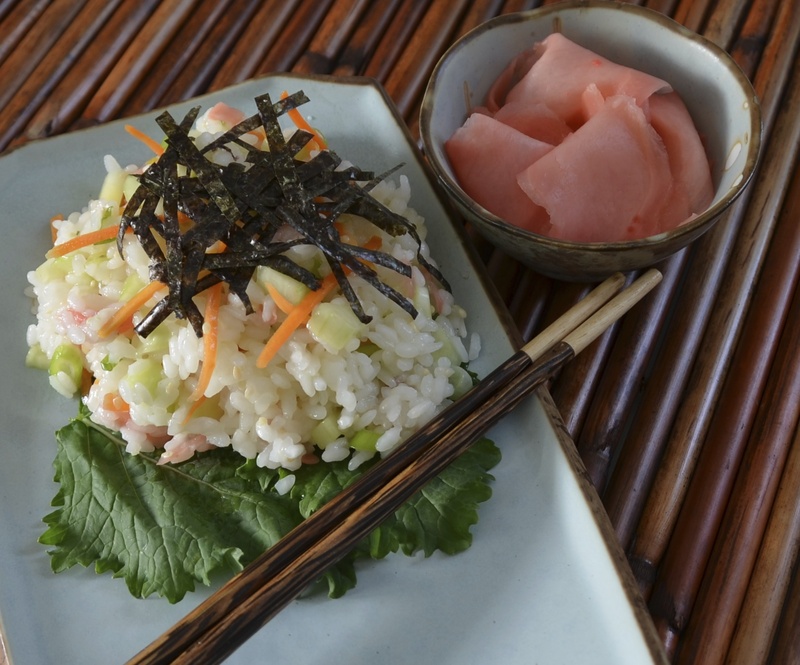 It picks up all of the subtle flavours of a fresh California roll, sans the crab. It is also very portable, so it makes a great pot-luck dish. Hold off on the avocado and nori until just before you serve it. I think you’ll like it! Rinse the rice in several changes of cold water in a bowl until the water is almost clear. Drain in a strainer for 30 minutes. Bring rice and 1 ¾ cups water to a boil in a 3 – 4 quart heavy saucepan, then simmer, covered, 2 minutes. Remove from heat and let rice stand, covered, 10 minutes (do not lift lid). While rice is standing, bring vinegar, sugar and salt just to a boil in a very small saucepan, stirring constantly until sugar is dissolved, then cool 2 minutes. Shave thin lengthwise slices from carrot with a vegetable peeler, then cut slices diagonally into ¼ inch wide strips. Whisk together wasabi, remaining 1 ½ tablespoons water, and oil in a bowl, then add rice, carrot, cucumber, scallions, pickled ginger and sesame seeds and toss gently. Halve, pit and peel avocado and cut crosswise into ¼ inch thick slices. Arrange rice mixture on plates. Top with avocado slices and sprinkle with nori strips. This recipe is best eaten immediately, but if you want to eat it the next day, just whisk together another 1 ½ tablespoons vegetable oil and 1 ½ tablespoons water and a bit of wasabi and add to the salad. want it now-night munchies-so beautiful!! Hey Jacqui! Glad my recipe caught your eye! It really is beautiful when you make it…and even more beautiful on the taste buds! Thanks Geraldine! Glad you like the presentation and please let me know what you think of the recipe when you get a chance to try it! Thanks Shelley! That is so kind of you. The sushi roll salad looks very delicious. I love the colour combinations. Thanks for sharing! Hey Shelley, I’m glad to hear that! I hope you like the end product!! Have a great weekend! Yes, but I love the shrimp in your salad and I can’t wait to make it!